Fleet Valid, a hard knocking gelding by Montbrook, was a just a claimer during the majority of his 28 starts. 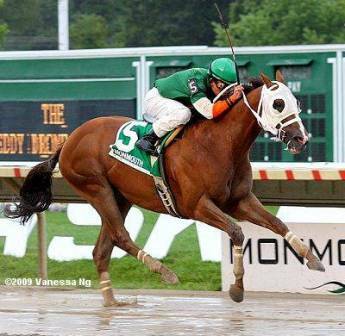 The striking chestnut finished his career in a blaze of glory however, when in his final three outings, he consecutively won the 2009 Teddy Drone and Icecapade Stakes at Monmouth Park and finished third in the Frank J. DeFrancis Memorial Dash Stakes (gr. I) at Laurel Park. He was retired after that by his owners, who felt Fleet Valid deserved a rest after five years of steady competition in Kentucky and the East Coast circuit. 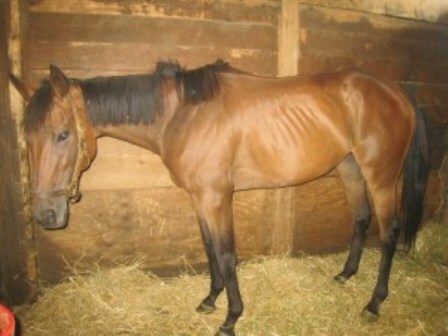 They donated him to ReRun’s retirement program in hopes the gelding could have a chance at a second career. 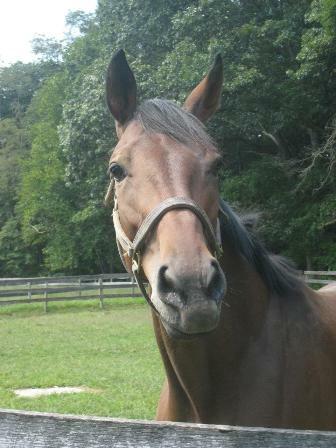 Despite his gentle nature and willingness to learn, however, Fleet Valid is still awaiting adoption. He has now been with ReRun for around a year and a half. 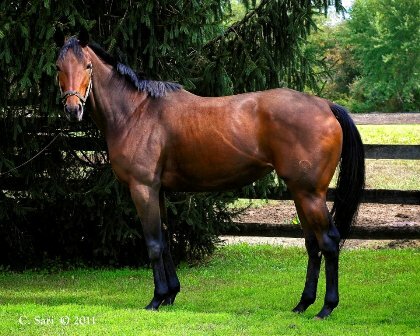 ReRun is a non-profit Thoroughbred adoption program with a mission to rehabilitate, retrain, and find new homes for racehorses once their careers have ended. 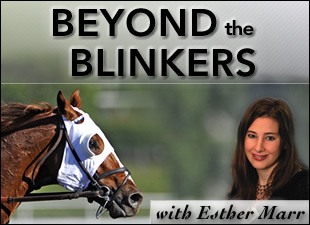 To shine a spotlight on Fleet Valid in hopes he will soon be given a forever home, I decided to conduct an interview with Eliza Scheurman of ReRun, who spends time with Fleet Valid daily and personally knows what a quality horse he is. Scherman is the author of the ReRun blog, where she first notified the public about Fleet Valid. EM: Where is Fleet Valid currently located? ES: He is located in Perrineville, N.J. at one of our foster farms, Nearaway Farm. EM: Are there any other special traits you can name about him other than was mentioned in the blog? ES: He loves treats!!! He will start nickering as soon as he hears the wrappers crinkle! He also loves to be groomed and just really likes attention in general. He is very people oriented and really enjoys hanging out and being fussed over! 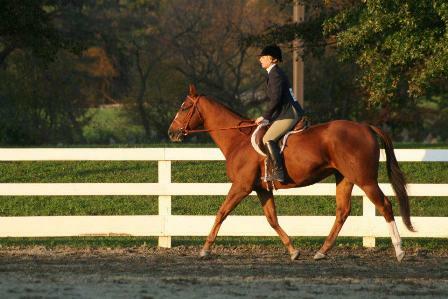 He went to his first horse show, the ReRun All Thoroughbred Charity Horse Show at the New Jersey Horse Park in October. He took home First Place in the Beginner Hunter-Walk Trot and Beginner Hunter-Walk, Trot, Canter classes! He was competing against about 20 other horses in the class, many of which have been to several other shows before! He handled it like a pro, completely relaxed and perfectly behaved. EM: What’s Fleet Valid’s daily routine like? ES: He gets breakfast in his stall, and then is turned out with his best friend Jehu for the day. He is then brought back into his stall for the night and fed dinner. I usually arrive around 6 p.m. (after work) and groom him, then we ride in the facility’s indoor arena (because it’s dark out). He does walk, trot, and canter. He knows his leads! He also trots over ground poles and small cross rails. On the weekends, I take him out on the trails occasionally. He seems to enjoy taking long, leisurely walks and enjoying the scenery out on the trails. EM: What kind of person would be well suited to adopt Fleet Valid? ES: Fleet would be great for someone who wants to do Dressage, Hunter Hack, Western Pleasure, or have a nice pleasure horse to ride and go trail riding. EM: What’s he like physically? ES: He is about 16 hands, and is built like a big Quarter Horse! EM: How long has Fleet been in ReRun’s program and did his former owners donate him? ES: He has been with ReRun for about a year and a half. His last racing owners donated him to our program when they realized he was not going to be competitive at the highest levels of competition anymore. They wanted to give him a chance at a second career. I also wanted to highlight another stellar ReRun horse named Fagedaboudit Gal (barn name is "Farrah"). ReRun received a phone call last summer about Farrah, a 6-year-old daughter of Unbridled Jet, who was found in a feed lot in central New Jersey. Farrah was in terrible condition upon her arrival at ReRun. She was extremely malnourished, and after a veterinary evaluation, it was discovered that Farrah had a suspensory injury in her hind leg and would have to go on stall rest. The photos in Scheurman’s blog of Farrah are absolutely heartbreaking and brought tears to my eyes. In the blog, Scherman gives a raw and eye-opening description of her first impression of Farrah: "Perhaps the saddest part of all was that her eyes were defeated, as if she knew that no one cared about her...that she was thrown away…that the people who trained her, groomed her, fed her, exercised her, raced her, owned her…they forgot about her when she needed them the most." The good, news, however, is that Farrah is now getting adequate care and has made huge strides from her original condition. In fact, she has started doing some light training and is almost ready to be adopted into a new home! Read more about Farrah’s story here, here, and here. “Since the most recent blog post, I have started riding Farrah and she has taken to her retraining wonderfully! She is completely sensible and willing. She has been quite easy to retrain and is currently doing walk and trot and learning about leg aids, circles, and serpentines.